Oh baby, it's cold outside! Even if you live in a warm climate, there is still a weather change and we will all be feeling the need for some food that will take the chill off our bones. As it gets darker outside earlier and the winter wind is blowing... I'm thinking warm comforting soup. I can't think of anything more satisfying on a blustering day! Soup is such a great way to feed a family, large or small. Most soups freeze well, making them good for tonight and again for another night next week. Although we all have our favorite soup recipes, we are always on the lookout for another new favorite. This first recipe only takes 20 minutes. 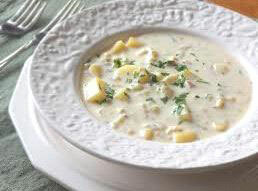 It is a rich, creamy soup and I'm guessing even though I like it, most children probably won't. I would definitely do soup and a sandwich with this recipe. I just tried this recipe. It is courtesy of Giada De Laurentiis. The mixture gets run through the blender so it is very creamy. I added extra chicken stock because I thought it was too thick. The recipe calls for 1- 8 ounce bag of frozen artichoke hearts but I could only find a 12 ounce bag and I used the whole thing. I wasn't sure what mascarpone cheese was and I wondered if you could substitute it with cream cheese. You can't! Although they are similar, the mascarpone cheese is sweeter and the texture a little softer. I found this cheese at my neighborhood store so it wasn't hard to find. I also garnished this with croutons instead of chives. This recipe serves four but with the extras that I added, it could serve six. Heat olive oil in a heavy, large pot over medium heat. Add the leeks and garlic and stir. Add potatoes and cook for 5 minutes, stirring often. Add the artichokes, broth, salt and pepper. Cook until vegetables are tender, about 20 minutes. 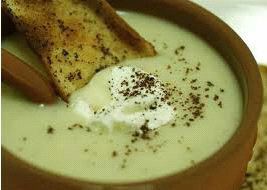 Using a handheld immersion blender or blender in batches, puree the soup. Add the 2 tablespoons mascarpone and blend again to combine. In a small bowl, stir the remaining mascarpone to soften. Ladle the soup into serving bowls. Dollop the top of each of the soup bowls with a spoonful of the softened mascarpone cheese and top with cheese and chives. *When blending hot liquids: Remove liquid from the heat and allow cooling for at least 5 minutes. Transfer liquid to a blender or food processor and fill no more than halfway. If using a blender, release one corner of the lid. This prevents the vacuum effect that creates heat explosions. Place a towel over the top of the machine, pulse a few times then process on high speed until smooth. The juices the clams are processed in taste very different to me. I rinse the clams in cool, fresh water and use bottled clam juice. Melt 2 tablespoons butter in stockpot. Add the onions and cook over medium-low heat for about 10 minutes or until the onions are transparent. Add the celery, carrots, potatoes, thyme, salt, pepper and saute for 10 more minutes. Add clam juice and simmer for 20 minutes. In a small pot, make a rue using the remaining butter and whisk in the flour. Cook on low heat stirring constantly for about 2 minutes. Whisk in a cup of hot broth into flour mixture and pour this back into the vegetables. After a few minutes of simmering and the broth is beginning to thicken, add the milk and clams. Simmer 10 more minutes. Add salt and pepper as desired. In a large saucepan, cook rice blend according to box instructions. Saute vegetables in butter until tender, about 5 minutes. Stir flour into vegetables. Add remaining broth to vegetables and cook until thickened. Add this to the cooked rice. Add remaining ingredients. 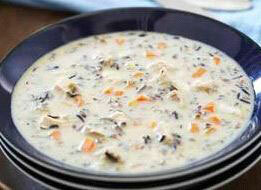 This cream of wild rice soup is one of my all time favorites. These soups will keep you warm and satisfied. Bring it on Mr. Winter!